I was a subscriber to Edson Gould’s “Findings & Forecast” from 1974 to 1979. 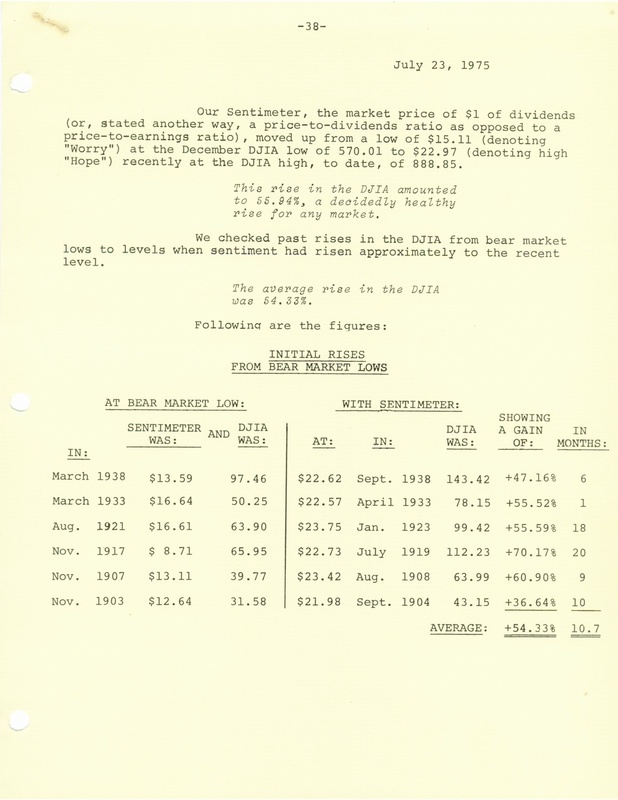 Impressed by Edson’s genius of calling market tops and bottoms with remarkable accuracy, I began keeping all of Gould’s special reports, yearly forecasts and important portions of his market letters. These publications still exist in my library 38 years later (perfect condition). I have recently scanned all of these publications into PDF format. Having never written a book, Edson Gould’s stock market memoirs are apparently contained in his market letters and special reports. Searching the internet I’ve found a couple of his reports and none of his market letters. Except for my library of Edson Gould publications, it’s certainly possible that his stock market observations have been lost. Some may say that Gould’s publications are old and not relevant. A perfect example of the fallacy of this statement exists in the small booklet “One Way Pockets”. I would strongly urge you to read “One Way Pockets” available at Amazon for less than $10 in paperback or $6 for the Kindle or iPad. This little stock market gem was written in 1917 and contains a wealth of important information and certainly illustrates how human behavior doesn’t change. I wish I had found this book when I was beginning my stock market education in 1956. It could have saved me years of running into blind alleys. In the beginning when I was young, ignorant and a “know-it-all”, I believed that nothing of genuine importance could come from the distant past, and so I restricted my reading to reasonably current publications. What a waste, but these are the actions of the young who always repeat the same mistakes of their predecessors. One of Edson Gould’s favorite sayings was that “History always repeats, only the details change”. Gould believed that the stock market was moved by the emotions of the crowd. These emotions (fear, panic and greed) created extremes that generated stock market peaks and bottoms. Bob Farrell was another stock market legend that believed in the extremes of crowd emotions. He visualized the market like a pendulum that swung back and forth over long periods of time from euphoria to panic. Psychology and crowd behavior are a timeless and inflexible behavior. The ultimate book illustrating crowd behavior is “Memoirs of Extraordinary Popular Delusions and the Madness of Crowds” by Charles Mackay (1852). It is available for free from Google Books and can be downloaded by clicking on the above link. This entry was posted on October 28, 2011 at 6:07 PM and is filed under 2 - EDSON GOULD. You can subscribe via RSS 2.0 feed to this post's comments. You can comment below, or link to this permanent URL from your own site.